Take the bubble-bursting puzzle gameplay of the popular Bust-a-Move series, turn it on its side and toss in some magical spells and memory matching puzzles and sharp cartoon visuals and you've got Supermagical, an award-winning iOS game from Super Awesome Hyper Dimensional Mega Team, a developer with an obvious appreciation for understatement. Nina, a tiny witch with a knack for getting into trouble, has unwittingly unleashed the colorful and mischievous Minix upon the world. The six wizards she lives with tried to contain her mistake and failed, so it's up to her to take on the color-coded creatures, one bubble-popping sage at a time. Like its obvious inspiration, Supermagical is a game about color matching. Instead of bubbles firing at bubbles descending from on high, we've got magical spheres firing at globular creatures as they slowly march across the screen. 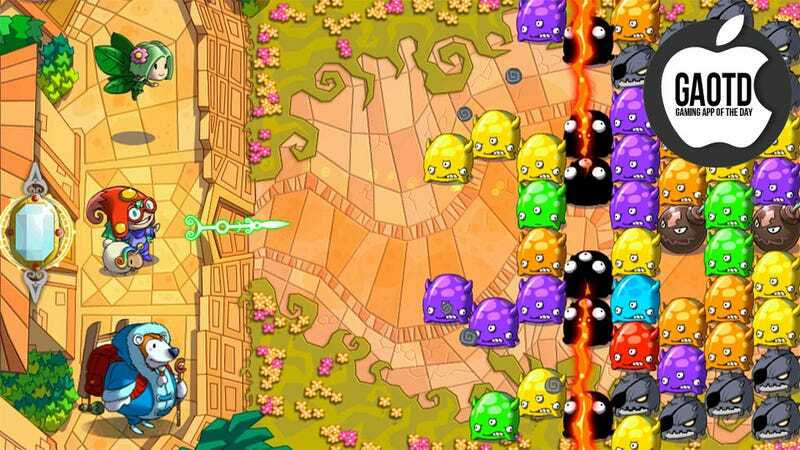 Slide your finger along the side of the screen to aim, release to shoot, and tap the screen to collect coins and gems that appear once your enemies explode into a puff of magical smoke. The core quest, spanning some 71 levels of Minix-matching madness, sees Nina freeing her captive wizard companions from the clutches of her seven deadly sins-inspired sisters. Once free, those wizards (two at a time, selectable by the player) will add their special magical powers to Nina's arsenal, giving her fresh new ways to clear the screen. Supermagical isn't a particularly challenging game. Puzzle levels are simple to conquer. Timed levels add urgency but are easily overcome. The biggest challenge for the player is making enough money to keep progressing through the game. Certain levels require items be purchased from the in-game market at exorbitant prices, requiring the player to either farm money from previously completed stages, or drop a little real cash on some fake cash. Once I got to the point where I could progress no further without farming or buying gold, I stopped playing. Still, even with that barrier in place I'm sure I got my $.99's worth out of Supermagical. It's another bubble-popping game, but it's quirky and colorful enough to feed the Bust-a-Move beast lurking inside me, at least for a little while.